The Children’s Financial Literacy (CFL) program was designed in 2008 to provide fun and engaging financial education to disadvantaged children. The program is integrated into the regular school curriculum and encourages students to develop lifelong savings habits at a young age. The program also connects children with a savings account at a community-owned bank. This assists children in developing savings habits and enables access to financial services. To ensure the success of the program, we implement it in three stages. Firstly, children are taught about financial literacy in the classroom with lessons every two to three months. Home visits are then conducted by Cufa project officers to assess progress and encourage family involvement. Finally, training workshops are organised for school staff in participating schools. Thus, the knowledge can be retaught independent of Cufa project officers. Thanks to this approach, families and school staff also benefit greatly from the program. A combination of digital and print material is used, resulting in the most effective learning of the projects by students. This includes a storybook about Ronnie Riel’s adventures, a lesson book illustrating the importance of saving and a CFL app that is used on a tablet. The app is a highly effective tool in reinforcing the skills developed through the program. After participating in Cufa’s CFL program through his primary school, Samnang Sum was able to completely change his life. Thanks to Cufa staff, he opened a savings account with his local community-owned bank and is constantly making deposits. 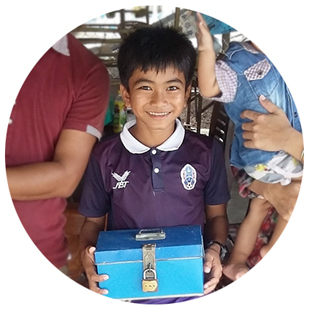 The program taught him about the value of money and now Samnang has developed both short and long-term goals. He has set his sights on using his savings to fund his education, he would like to become an engineer.